Now we're hearing that Intel is reacting to the price/performance monsters that are Ryzen, with their upcoming Core i3-8300 processor based on the Coffee Lake CPU architecture. Core i3-8300 will be a 4C/8T processor, a departure from the usual 2C/4T that Core i3 CPUs arrive as, with Intel leaving the Core i5 as a quad-core 4C/4T processor without Hyper-Threading enabled. Core i7 processors are usually quad-core processors with HT enabled, minimum. But with AMD hitting the $109 price point with Ryzen 3 1200 being a 4C/4T processor, Intel isn't even close with its $129 processor in the Core i3-7100 which is a 2C/4T processor. Intel's higher-end 4C/4T processor is $179, with the Core i3-7100 being $70 more than Ryzen 3 1200. The Core i3-8200 would be an interesting move, but something that Intel is going to have to do in order to fight on a totally revamped battlefield. The source on this Coffee Lake-based Core i3-8300 says that Intel's upcoming Kaby Lake-R PCB will hit mass production later this month, and will be listed in October. Cannonlake PCB engineering samples should be in the wild, with QS in November and mass production in January, with a listing in February 2018. If Intel were able to release the Core i3-8300 at $149 or less, they would really bring some excitement to the party. 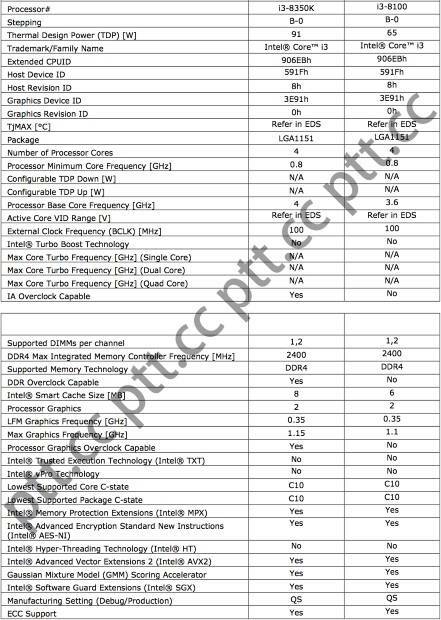 The Tech Report quotes a Chinese source that they will be 4C/4T without HyperThreading, just lacking TurboBoost that the i5 features, which is quite a bit more believable, Intel targeting these processors at overclockers while the i5 is mainstream, especially given the fact that Intel is still pricing their processors above AMD well above the percentage that they are better than AMD. If Intel were to put HyperThreading on an i3, there would literally be zero reason to choose an i5 with half the threads and only a few hundred megahertz clock advantage.